Straight grain walnut veneer to upper section of dashboard and door cappings. Instrument binnacle in front of driver incorporating mixture of bar instruments and electronically driven analogue speedometer and rev counter, also TV Vehicle Condition Monitor with digital read-outs, all in a matt black surround. Completed revised analogue instrumentation binnacle fitted from 1990 within wood veneered surround. Supplementary switch panels flank steering column containing lighting switches on one side and on-board computer controls plus cruise control (where fitted) on the other. Black two-spoke steering wheel with prominent centre boss containing oval growler emblem (later changed to four-spoke incorporating air bag). Multi-use stalks either side of steering column operating indicators, horn, main beam, wipers, and computer mode scrolling. Designs changed through production. Black plastic air control vents to extreme ends of dashboard and additionally a rectangular air vent system in the centre. Lockable passenger side veneered glove-box incorporating vanity mirror, etc. Later deleted to accommodate passenger air bag. Sculptured centre console area with wood veneer incorporating heater/air conditioning controls, auxiliary switchgear, audio unit, and gear lever/automatic transmission quadrant, plus damped ashtray and armrest storage box with hinged lid. Handbrake sited between driver's seat and centre console, with black vinyl surround. Pre-formed solid door panels to match trim, with armrest pulls, pocket areas, and door-mounted audio speakers (design later changed). Chromed pull door handles. Electric window lifts on all models operated from black controls within armrest area (design changed several times throughout production). Individual front seating in tweed, later changed to cloth (leather at extra cost) with vertical pleats at the rear incorporating rear lighting in the headrests (later moved to seat backs). Rear bench-type seat arrangement with centre fold-down armrest and initially no headrests. Boot area carpeted, with carpet cover to vertically mounted spare wheel, and black attache case style tool box fitted. From 1992 spare wheel position moved to accommodate carpet-covered battery area and tool kit relocated to rear inward face of valance. Passive-style seat belts were made available for the US market. 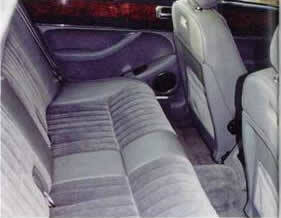 Cloth replaced tweed for the interior of non-leather eguipped cars, along with revised door trims. 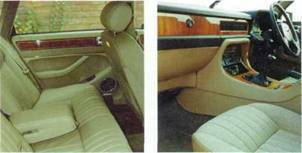 As XJ6 except for full walnut veneer interior with boxwood inlays to dashboard and door cappings. Instrument binnacle set against mock-wood veneer background. Leather upholstery with vertical pleating. Front seats electrically adjustable from switch pack on sides of centre console. Enhanced audio system fitted, initially of Clarion manufacture. Above left: Jaguar Sovereign models became equipped with boxwood inlays to the veneer, later also adopted for Daimler models. 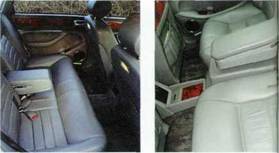 Above right: For base models tweed style upholstery was fitted, along with a plainer straight grain woodwork. Air conditioning was an extra cost option initially. As Sovereign except for 'D' badging to steering wheel centre boss. No boxwood inlays to walnut veneer on earlier cars. Flatter, wider pleated all-leather seating of revised style, the front seats incorporating walnut-veneered picnic tables in the rear with chromed drinks coasters. Rear seating of individual style with enlarged centre fold-down armrest and console area over transmission tunnel incorporating veneer finishing and 'Daimler' scripted badge. Door trim design entirely different to Jaguar models with separate armrest arrangement and more pronounced door pockets. Wood-veneered surrounds to door window lift switches. Nylon over-rugs fitted to rear compartment. Electrically operated sun-roof panel standard fitment. With introduction of the Double Six model in 1993 matched leather-clad gear knob and handbrake surround were incorporated. From 1994 ruched leather seating of more rounded style available. NB: US spec cars usually of the higher quality Sovereign or Daimler equipment levels. 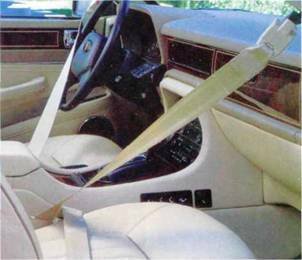 From 1990 passive seat belt arrangements were also fitted to some US models. Throughout Daimler production it was also possible to specify conventional bench-type rear seating. As XJ6 but part leather/part cloth upholstery mix introduced still with vertical pleats. Fitment of rear seat headrests. Revised door trims, later fitted to all non-Daimler models with curved armrest pulls. Walnut veneer added to replace straight-grain veneer. As Sovereign except stiffer and more sculptured front seat bolsters. Laser-etched 'V12' gold emblem to glove-box area. Later style instrument binnacle, door trims, and four-spoke steering wheel. As XJ6 except for seating incorporating horizontal wide pleating both front and rear with stiffer bolsters. Rosewood-stained maple woodwork instead of walnut veneer. No boxwood inlays. Dashboard top roll and door cappings colour keyed to rest of interior trim. Revised seating style, rosewood woodwork, and contrast upholstery separated the S model from normal Jaguars. Above left: The S seating with horizontal pleating. Above right: For the last few months the top of the range Daimler versions were offered with ruched style leather upholstery. 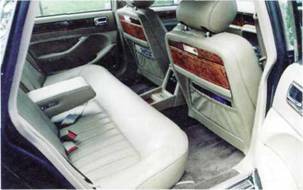 As XJ6 except for unique wide vertical pleating to leather seating incorporating the stiffer bolsters. Handbrake surround and dashboard top roll/door cappings trimmed to match interior. 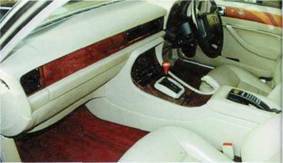 Interior trim changes dependent on individual order requirements, usually featuring magnolia leather. Momo four-spoke matching leather steering wheel. Contrast piped upholstery with contrast carpeting. Some later cars equipped with Daimler-style door trims, and some cars equipped with either walnut veneer or walnut with boxwood inlays. Leather-clad gear shift knob on all models.